Our final night in Vietnam we went to see a water puppet show and had our final group meal. 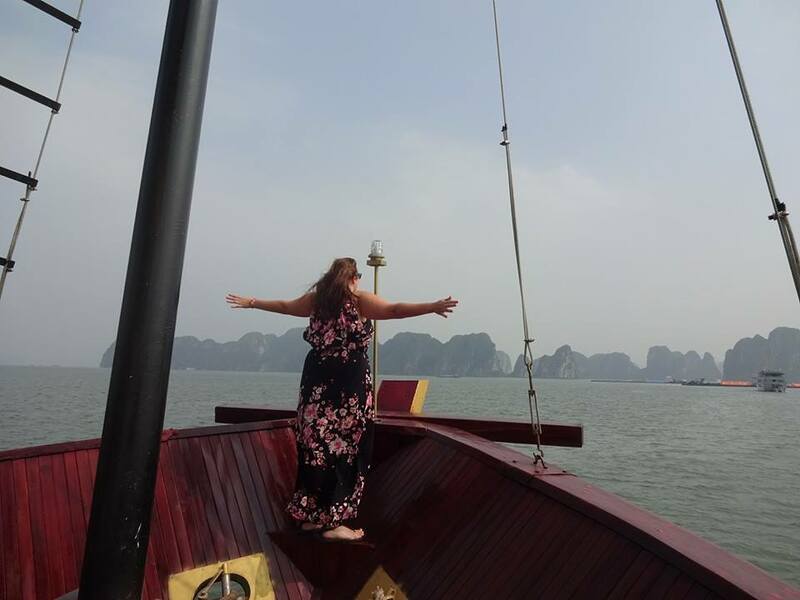 It was pretty anti-climatic, but it’s hard to top Halong Bay. I have loved every second of my tour of South East Asia. I’ve met some truly amazing people. A few who I hope to be friends with for the rest of my life. I will honestly miss Becky, Sam, Adam, Rhys, Lee and everyone else too! It’s been an amazing life changing experience. I feel like I’ve grown into a more confident, happier and braver citizen of the world. Every expectation I had for this trip were blown out of the water! Check out my next post for an overall review! 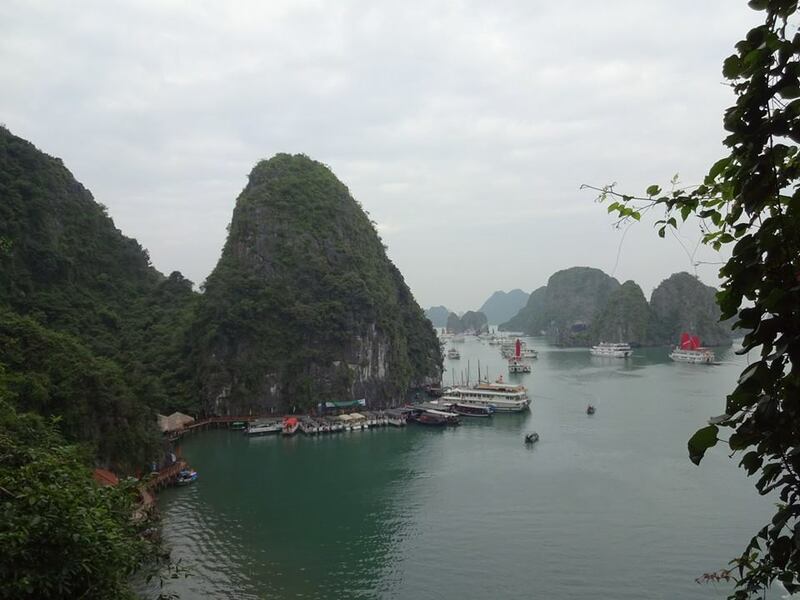 After a three hour drive from Hanoi we arrived to Halong Bay. To board our junk boat we had to catch a ferry. Our group was split up when a bunch of Chinese tourists invaded our ferry. So half of us had to figure out which boat was ours without our local guide! After searching we eventually found it. Then we boarded our beautiful Chinese-style junk boat for an overnight cruise. Our ship was absolutely stunning. It was a five-star cruise ship. defiantly more than what I expected. 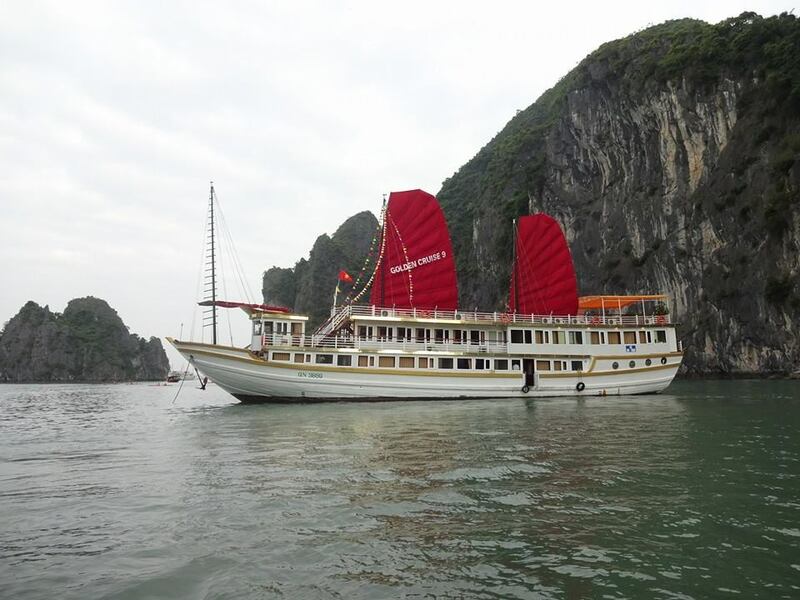 The company is called Halong Sails. It would recommend them to anyone! Our room was the fanciest of the trip so far and the best was like sleeping on a cloud! 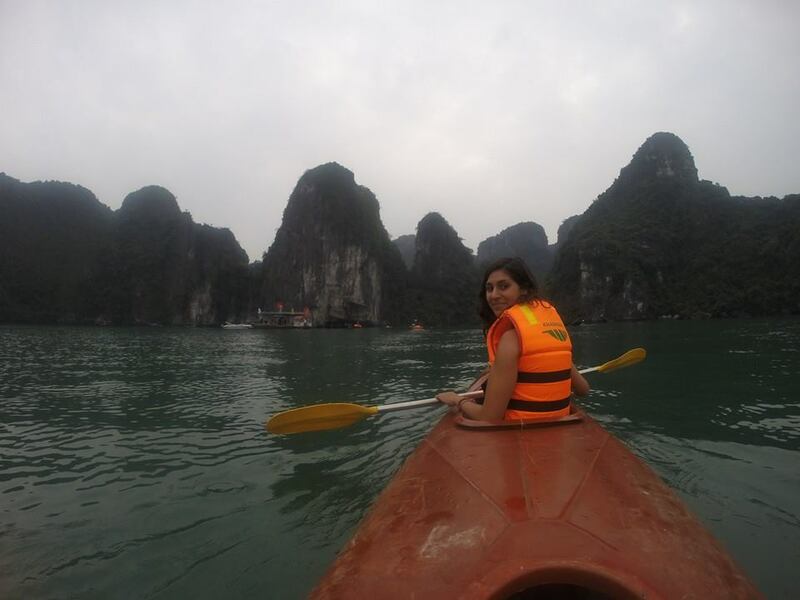 After a bit of sun bathing on the top deck we jumped into Kayaks to explore the lagoons and secretive mountains of Halong Bay. For a while we were alone in a beautiful lagoon surrounded by towering mountains. It was so peaceful and quiet. We paddled through the stunning blue waters and past playful monkeys. It was simply breath-taking. As we were leaving several tourist boats zoomed by us and into the lagoon. I’m very glad we had the place to ourselves while we could. After kayaking the sun started to come out so we headed to the beach. While some people trekked to the top of a mountain I decided to take a nap on the beach. It was glorious and refreshing. I felt well rested which was important because that night we had a “Pirate Party”! The party was wild! I drank my weight in vodka and even got to DJ. I got a bunch of people to dance by playing mega hits like “Grease” and Spice Girls. We even convinced the cabin crew to dress up. At one point the bar stopped keeping track and we were pouring our own shots! I woke up early in the morning with only a mild hangover. But my hangover was amplified when we went to the VERY loud Sung Sot Caves. We had to wait in a long line and push through tons of tourists before getting into the caves. Our guide neglected to mention the winding staircases and long hike. So those of us who drank a bit too much the night before had a pretty rough time at the caves. But we had a great time laughing at each other’s misery! 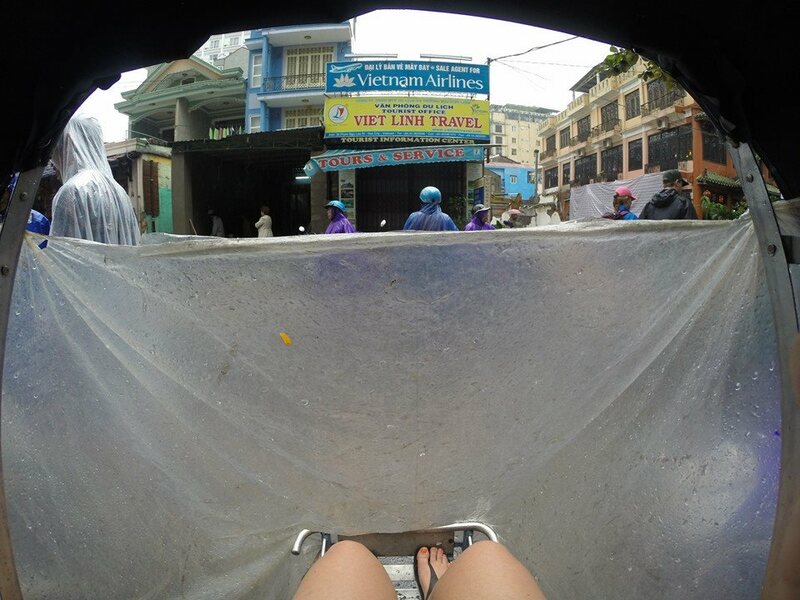 We arrived in our Coach to the very flooded city of Hue, Vietnam. 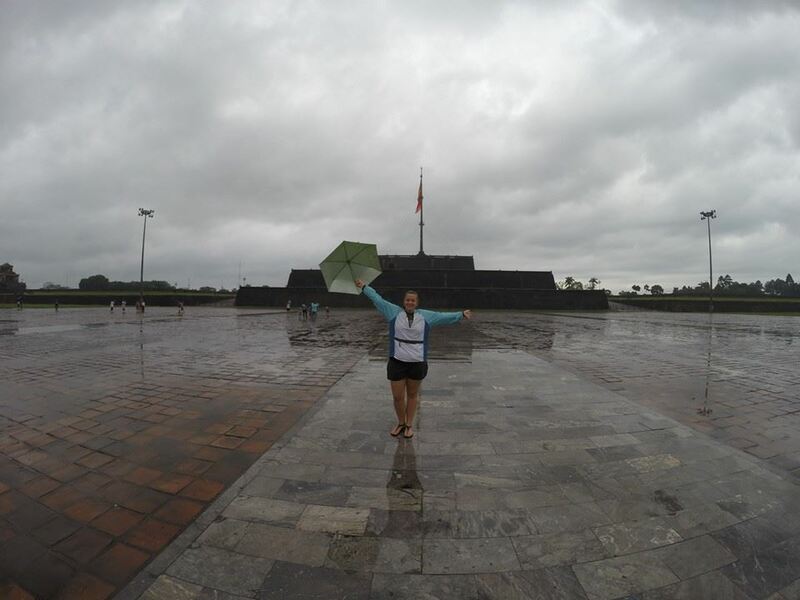 Because of the rain we thought our cyclo tour might be canceled but the rain died down just in time! So we sat back and relaxed as we were biked around Hue and into the imperial city of Hue. Next stop the Tu Duc Mausoleum. Our Local Guide showed us around the enchanting old palace. We learned about the emperors and visited the temples, pagodas and pavilions. Then after a quick bus ride we visited the breath-taking Thien Mu Pagoda. We had the privilege to witness a buddhist monk prayer session. It was truly mesmerizing. Today we explored a series of Hindu Temples called My Son. My Son is a UNESCO world Heritage-listed site that was built between the 4th and 14th century. It was like being in Indiana Jones! The temples still see so wild and undiscovered. They’re tucked deep into the jungle and surrounded by vast mountain ranges and overgrowth of trees and vines. On the ride back our local guide told us his fascinating life story. He was a intel solider and translator for the American Army during the Vietnam war. His story should be made into a movie! This morning we flew to Hoi An. 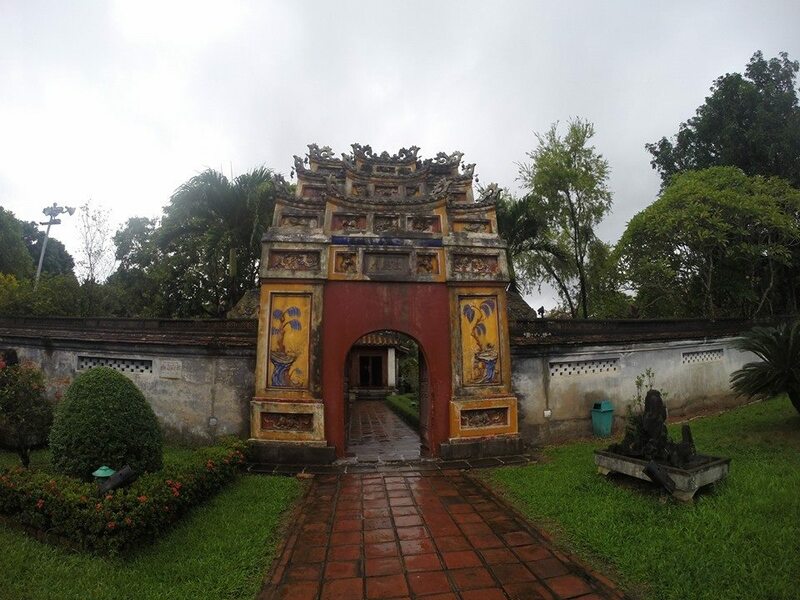 Hoi An is a charming down that is rich in history and culture. It blends French and Chinese influences in its art, architecture and food. We rented bikes and were led on a great tour through the town where we saw UNESCO World Heritage sites, adorable shops and a beautiful Japanese covered bridge that is 400 years old! Adam and I pretending to be VIPs in the Airport and me in my new romper! Then we went to Yaly Coture to have clothes made! I brought several pictures and designs that I wanted to have custom-made. I got two rompers and a stunning fringed purse made from genuine leather. Throughout the adventure of having measurements taken and picking fabrics I hung out with this great guy named Adam. We had a lot of laughs and enjoyed the experience immensely. It’s impressive what they can make in just 24 ours! After finalizing our designs we rode bikes to our cooking class at Morning Glory Cooking School. Our teacher was friendly, entertaining and a great teacher. We learned how to roll spring rolls, make Vietnamese pancakes, screwers and afterwards devoured all of our yummy creations. Later we had to navigate winding roads and pouring rain to figure out how to get back to the hotel! It was quite an adventure. But eventually we made it home safe and sound! Today was one of the best days of my life. Early in the morning we boarded a boat and sailed to an island of the coast of Nha Trang. On the way there we sang and basked in the beauty of the South China Sea. Our first stopped was snorkeling off the island of Hon Mun. The water was turquoise and clear. There were little reefs right off of the beach so it was very easy to see the corals and fish. There were tiny colorful fish and big strange-looking ones too. I snorkeled nearly the whole time while others sun bathed and started drinking. After several hours on the beach we got back on the boat and the party started! Everyone was drinking and singing. I started downing my personal bottle of vodka! The boat really started “rocking”. We had a party break and were provided a monstrous feast. After stuffing ourselves our ship pulled up beside two others and then we hopped the ship to have a group karaoke party and music show. Our local guides were hilarious. They sang cover songs and even made some of the guests get up and sing! It was a great time. Then we stumbled back onto our own ship where we took shots before jumping into the water from the roof of the boat! They threw us tubes and then we hung out in the stunning bay. They even set up a floating bar for us to swim to! Eventually it was time to head back to shore. So settled back into the boat. 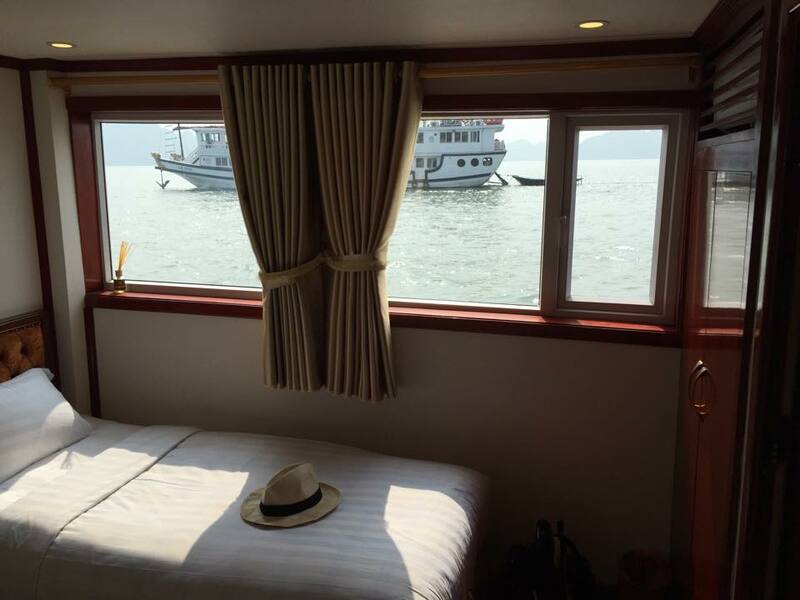 I put on my headphones, hung my feet off the side of the ship and reflected as we sailed back to Nha Trang. It was magical, beautiful and life-affirming. 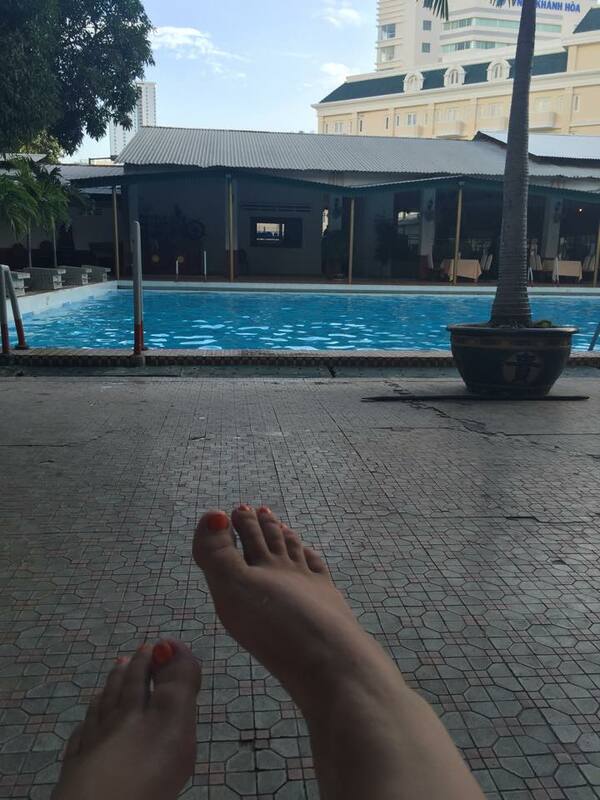 By the time we got back to Nha Trang most people (including myself) were extremely intoxicated. We didn’t want the party to stop so we headed to our hotel pool and continued hanging out. I fell asleep (okay passed out) and when I woke up it was night-time. We went back to the Sailing Club for dinner where we reminisced about the adventures of the day. I loved every second of the day. It was truly amazing. I think it may be one of the best days of my life! Yesterday we flew to the Vietnamese beach town of Nha Trang. This is a booming tourist destination full of pale Russians and rich beach goers. We decided to treat ourselves by heading to Thap Ba Hot Springs for some relaxation and natural spring water treatments. I loved sitting in the warm mineral pools but the mud bath was the real highlight. I’ve never done anything like that before. The mud was cool and grainy. We spread it all over bodies to exfoliate and cleanse. After the mud bath we got into jacuzzi and relaxed with hot water and beers. Later everyone got dressed up and we headed to a swanky restaurant right on the beach called Sailing Club. 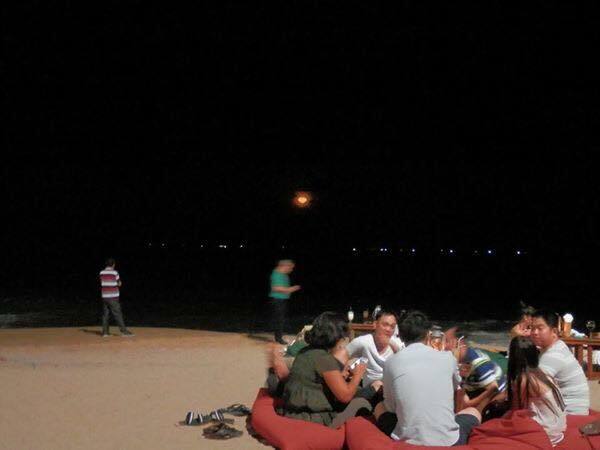 We ate on the beach under a full moon. I had a couple of beach cocktails and a fantastic steak. Later everyone grabbed bean bags and watched dancers as we hung out around the bonfire.